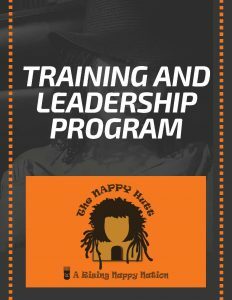 The Nappy Hutt training and leadership program has been developed for two main reasons. The first reason is to better serve our customers and secondly, to better educate and train valuable team leaders within the growing Nappy Hutt system. After years of training and educating, Shawntel M. Waajid has put together a system that will help stylist achieve the goals they always dreamed of. The program helps stylists become well trained, but it also rewards them financially for achieving those educational levels. It’s about growing with the program, learning how to take care of our clients hair and provide them with the best service imaginable. The program will teach you to become leaders in the industry, and help you expand into other locations and branches of the Nappy Hutt while being compensated accordingly. So, there is the challenge! Are you ready to have a mentor that is prepared to educate you and help you achieve your goals? We hope that you are one of the chosen ones that get to be part of this growing program. We’re looking for the best stylists so they can achieve not only the self recognition of knowing they are providing a valuable service but to also help them achieve the financial success that we all long for as we grow a business. If you’re interested in knowing more please feel free to email nappyhutt@gmail.com and in a few sentences say why you should be selected to join our exclusive program. If you’re selected we’ll invite you to a group presentation where we’ll explain the program and begin the selection process. We wish you all the best of luck.